Joe has a letter from William Shakespeare. Two graduate students, not alike in dignity. Joe's a poor boy from Vermont who's found a letter from William Shakespeare--saying he didn't write the plays. Posy's a Hollywood producer's daughter from Harvard, she's never met a high concept she didn't like, and she likes this one. Joe wants to save Shakespeare. Posy wants to make the movie. And Joe has a week to prove her wrong...but he hasn't counted on Posy. Or himself. 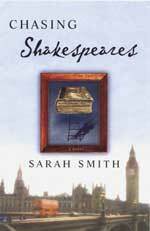 Three Shakespeare mysteries: When did Shakespeare die? Chasing Shakespeares is a play! Glad to talk about this anytime!